Promote clean waterways in style with this No Dumping Drains To Harbor magnet from Fridgedoor. 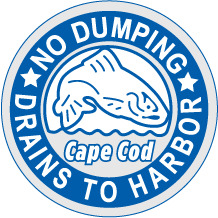 This icon is found on drains all over Cape Cod, Marthas Vineyard and Nantucket. This 3" diameter button style magnet features a full strong magnetic back.